Th-INK-ing of You: Pink & White Challenge - Happy Birthday! Hello my blogging friends! Hope your week is off to a wonderful start! I have something very different than my usual style to share today. 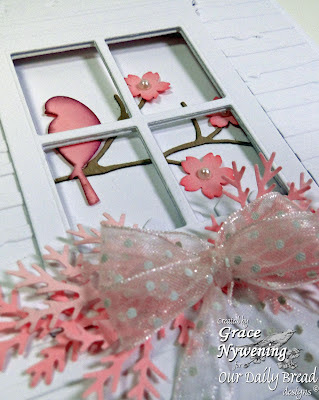 I created this card for Joan's Gardens Challenge, which was to use pink and white, an embossing folder, leaves as accent, and to use a die to cut an opening in the front of your card. This is what I came up with. 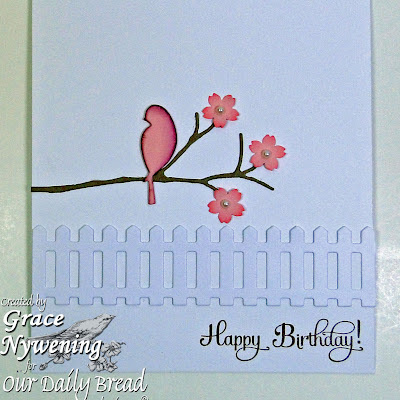 I used some new toys, and a favorite set from Our Daily Bread designs, Birthday Blessings. My base is Papertrey card stock, and I used a Memory Box Small Madison Window to cut my window frame out, cutting it twice so I could pop up a second frame on TINY pop dots. Not sure if you can see them but here's a close up of the frame. I also used a Cuttlebug Distressed Stripes folder for my front, and punched the pink boughs from scraps of pink card stock using a Martha Stewart bough punch. I added a tiny sheer dotted bow and left it very CAS. For the inside I used Memory Box dies: Nestled Bird, and Twigs & Berries. I also punched the tiny flowers with a CARL punch. 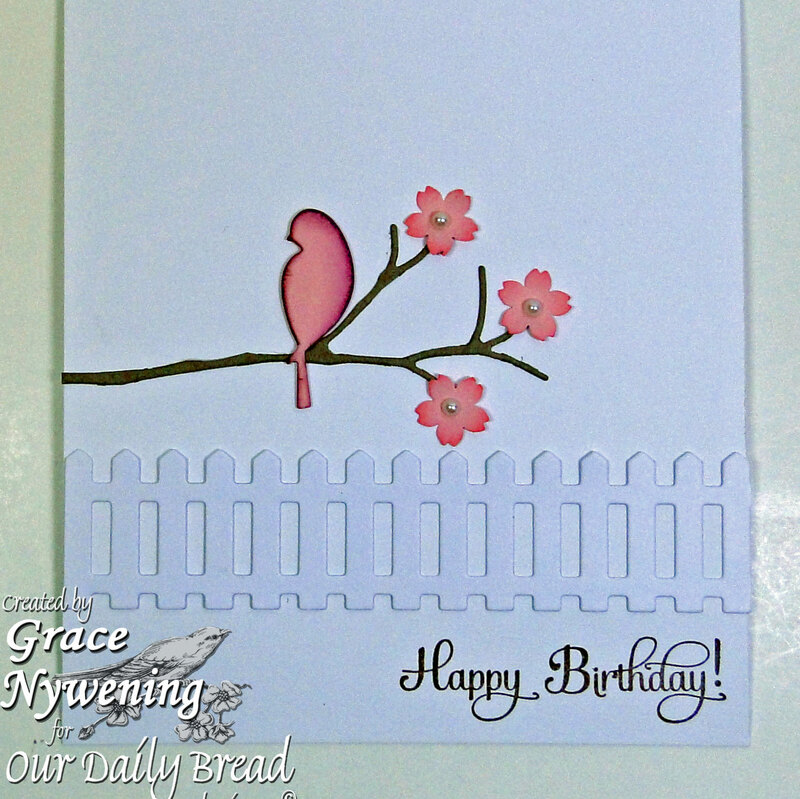 The fence is an Our Daily Bread designs custom die. I stamped the sentiment from the Birthday Blessings set with Memento Rich Cocoa ink. I added a little sponging and some tiny pearls and called it done. "Do not be hasty in the laying on of hands, and do not share in the sins of others. Keep yourself pure". A good thought for the day! This is gorgeous, Grace! So fresh with the clean design! Hope you are having a good day! Hugs! Lovely card, Grace! Looks just like you are outside a home looking through the window! This is simply stunning! The beautiful, soft colors you've used for this card are just perfect, and I love - love - love - the design! Spotted this on MIM. Grace I love this card! It is very pretty! I have made many window cards and I like how you popped the window with the dots - a great idea! Best wishes on winning at Joan's Garden and other challenges! This if stunning Grace - love your CAS style!! The dimension is stunning and the wee touches of colour are beautiful. let us try this again. This is gorgeous Grace!! 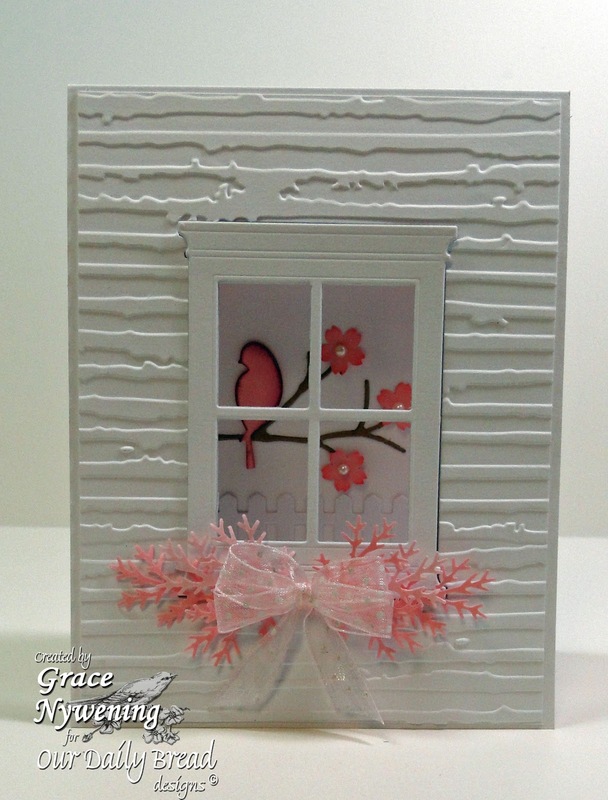 I just love all the white, your use of the window, and the embossing. Simply BEAUTIFUL! Grace this is adorable. I love the woodgrain for the house. Just beautiful! Thanks for joining us at Joan's Gardens for our Weekly Challenge. Thank you for joining us at Creative Stamp Friends. Grace, I always look forward to visiting your blog. TFS. 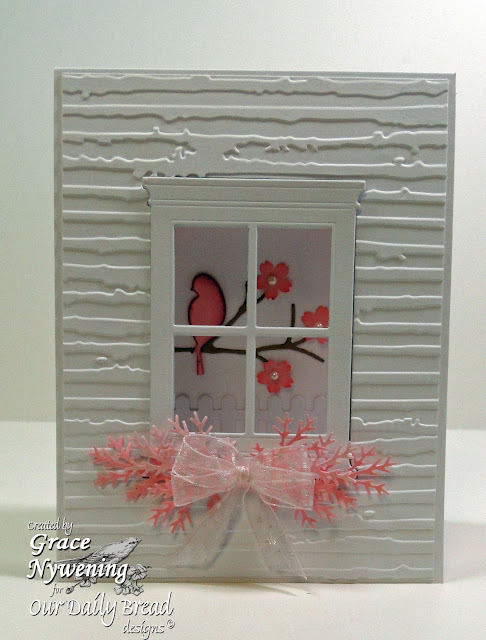 What a beautiful card Grace :) I love the clean look and the window looks so real! Wow, this is beautiful. Love it. Thank you for joining us at Lexi's Creations this time! Really sweet card. You did a wonderful job! Wow, what a stunning card you have made Grace! I saw it on MIM. this is just beautiful! Even though you said it is out of your comfort zone, you would never know it by the finished result. I love it! Sweet tweet! Love the simple beauty of these cards! How wonderful to see you popping in to my new website/blog! You always bring happiness to my heart and day! Stunning!Thanks for joining us at Lexi's Creations this time and good luck!